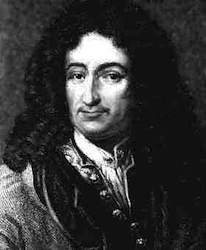 Gottfried Wilhelm Leibniz (1646-1716) was one of the most distinguished intellectual figures of the early modern period. Celebrated as a philosopher and mathematician, he also made significant contributions to the natural sciences, historiography, legal theory, and linguistics—to mention only a few of his interests. He is often described as the last universal genius: a thinker whose range extended to all that was known in his day. A prominent theme of Leibniz's writings is the systematic organization of knowledge, gathered from as many fields as possible, as a means to continued intellectual progress. Leibniz was instrumental in establishing major libraries in Hanover and Wolfenbüttel and scientific societies in Berlin and Vienna. He was fascinated by the application of technology to the solution of practical and theoretical problems. His working model of an arithmetical calculating machine attracted widespread attention and was the basis of his election to the Royal Society in 1673. In light of his overriding concern for system and method, it is no small irony that Leibniz left no complete or comprehensive statement of his thought. His contributions on a vast array of topics are found scattered in obscure journals, in hundreds of correspondences, and in a huge collection of unpublished manuscripts, the majority of which are preserved in the Gottfried Wilhelm Leibniz Bibliothek in Hanover. To date, there has been no complete edition of Leibniz's writings. One has been in progress since 1923 (under the direction of the Berlin Academy of Sciences), but it will not be finished until well into the twenty-first century. Only a small portion of Leibniz's writings have been translated into English. Fortunately, these include many of his most important philosophical works. Many interesting texts, however, remain unavailable in English. One of the aims of this site is to serve as a source for new translations of Leibniz's writings and writings about Leibniz's thought. Interested in learning more about Leibniz's philosophy? Here's a short guide to what you need to know. An initial attempt at cross-referencing some of the major correspondences from Leibniz's final decade. Copyright (c) 2014-2015 Donald Rutherford. All rights reserved.